Program #THOC001. Recorded in Española, NM on October 25, 2013. 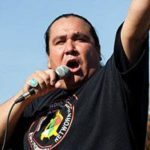 In this interview with David Barsamian at the 8th Annual Traditional Agriculture & Sustainable Living Conference, Clayton Thomas-Muller talks about his role in the Idle No More movement and indigenous-led environmental activism in Canada and around the world.